When you start considering an epoxy coating for your garage floor, it doesn’t take long to realize that not all are created equal. You soon find that there is water based and solvent based epoxy. Some manufacturer’s state they offer only 100% solids epoxy. Some are much less expensive than others for the same volume of product. So how do you know what differences to look for when comparing garage floor epoxy? Because of this, it’s important to learn the basic properties of epoxy floor coating products before you decide to apply a floor coating yourself or hire a garage floor company to do the job for you. This knowledge will help you greatly when making a decision about which product is best for you. So let’s take a look at each type of epoxy available to better understand what these differences are. Water or solvents are typically used as a carrier agent for some epoxy resins and assist in the adhesion, ease of application, and self-leveling properties. They also help to insure a longer period for application, also known as the pot life. As soon as you mix the part-A resin with the part-B hardener, the clock starts ticking as the epoxy begins its curing process and must be applied to the floor before the pot life runs out. Because of their ease of application, these types of epoxies are more user friendly and tend to be the more preferred solution for the DIY crowd. The average pot life is around 2 hours, which means you don’t have to rush to get it down on the floor, and it rolls on smoothly like paint. There are some disadvantages to these however. Once applied to the floor, these carrier agents evaporate leaving only the epoxy. So what you end up with is a thinner floor coating than what was initially applied. This happens because the carrier agent in the epoxy is not part of the actual floor coating. This is defined as the percentage in volume of solids in epoxy and is most noticeable in the difference between wet film thickness and dry film thickness. If an epoxy is labeled as 50% solids for example, it would have a wet film thickness of approximately 7 mils. Once the carrier agent evaporates, it will have a dry film thickness of 3 – 3.5 mils. Solvent used to be the preferred carrier agent in epoxy coatings for a few reasons. It can be applied in cooler temperatures and higher humidity and it does a better job at tolerating petroleum contaminates in the concrete surface. It used to have a slightly glossier surface than water based epoxy and in some cases is a bit more durable than their water based counterpart. The biggest problem with solvent based products however is the high VOC’s content (volatile organic compounds). It cannot be used indoors at all due to the fumes. When used in the garage, proper respirators must be worn during application and any open flames such as a water heater or furnace must be extinguished due to the high flammability. Because of the high VOC’s, many states do not allow solvent based products unless they have a lower VOC content. This has resulted in some solvent based epoxy products not being as good as they used to be. Consequently, they are getting harder to find as the industry has started using them less due to the tougher state regulations. Water based epoxy on the other hand has come a long way since the states started prohibiting products with high VOC’s and has now become the more prominent epoxy in use between the two. In fact, many have proved to be as durable as most solvent based products and some are capable of just as much shine. Additionally, they do not produce any of the fumes and odor that is associated with solvent based epoxy which makes them environmentally safe as well. Some water based epoxies can be applied to concrete that is still damp and can actually make for a good sealer to help stop hydrostatic pressure from moisture vapor transmission. This is why most epoxy primers are water based. A 100% solids epoxy doesn’t have any water or solvents to evaporate. As a result, they provide for a much thicker dry film coating of approximately 10 mils or more depending on the manufacturer and how it is applied. There are no VOC’s to worry about, thus making them environmentally friendly, and the coating cures solely by chemical catalization. They are commonly used for commercial applications and by many garage floor coating companies as well. 100% solids epoxy is more abrasion resistant, chemical resistant, and stain resistant than its water based counter parts. They work well as a color coat and medium to accept vinyl acrylic flakes and can last upwards of 20 years or more. This makes it the most durable of the garage floor epoxies by far. 100% solids epoxy can be more difficult to work with however do its thicker consistency and shorter pot life of only 30 – 40 minutes depending on temperature. They can be applied as a DIY application, but it’s important for the person applying them to be confident in his or her skills and follow the manufacturer’s recommendations closely in order to achieve a successful application. Though more expensive, 100% solids are the most cost effective garage floor coatings when comparing thickness and durability. Most epoxy paint kits sold aftermarket at the big box stores are not much more than 50% solids. They are designed as a one coat application and end up being 3 mils thick. There is aftermarket, multi-coat, water based garage floor epoxy systems that do better, but they still don’t compare to a 100% solids epoxy system. When making epoxy comparisons, be sure to take a look at the technical data sheets (also known as TDS) for the product. You can request these from the store or find them online. These sheets outline the properties and ingredients of the product and will give you a better idea of how one product compares to the other. Knowing the differences in epoxy coatings is an absolute must if you are going to hire a contractor to do your garage floor. That way you will know exactly what you are getting for your money. If you are going to tackle the job yourself, then you are already one step ahead of the game when it comes time to determining which product is best for you. Is it possible to use epoxy coating for concrete floor on an outside but covered porch? We have condensation issues on that floor when it gets really humid outside and what looks like just concrete paint has been chipping off. If we prep it properly and hire professionals to apply epoxy, do you think it would be ok outside (again, the porch is covered and screened). Thank you! If the porch is complete shaded you can use epoxy Tatjana. However, a polyurea or polyaspartic coating would be better. These type of coatings are U.V. resistant and will not amber at all. Keep in mind the coating is not going to stop the condensation issues. This is happening because relatively warm moist air is contacting a relatively cool surface and condensing. The condensation will not cause the coating to deteriorate, however, like the paint did. It may be a good idea to apply some anti-slip into the last coat to provide grip when it is wet. What brands do you recommend for a garage floor other than Rustolem ? Where woudl I get them? That’s a great question Matt. Most of the higher quality coatings are found online from concrete coating vendors. You will rarely find anything other than Rust-Oleum and the other brands of lower quality DIY kits from home improvement centers. Our sponsors are great examples of companies that sell great product. The other advantage is that many of these vendors have excellent customer service. EpoxyMaster, Garage Flooring LLC, Legacy Industrial, ArmorPoxy, and Garagecoating.com are great examples. I want to put a 3d image under clear epoxy can you tell me please what kind of print is suitable – would a self adhesive vinyl print work. Hello Rita. FloorPix are the people you want to talk to. They specialize in images for floor coatings including epoxy. We want to coat our unfinished basement floor to keep it cleaner and and a moisture barrier.. we don’t want to “finish” the basement but want to use it for a rec area and workout area as well as storage. We have a high water table and every now and then there has been moisture on the floor in certain areas — not enough for any mildew or to even rust on metal shelves, but the sump runs almost non-stop with the french drain. We recently made drainage changes in hopes of finding “the” solution. There are cracks in the concrete but I don’t notice any unevenness (the house was built in 1970). It is on septic. Is there a favorable product in these circumstances? I was looking at the big box solutions before reading your site, and now I am wondering about the 100% solid epoxy’s (are there recommended ones with our situation?) Is there a way to tell how much “etching” is required (I am concerned with chemicals going down the septic) for prepping? I was hoping to have a simple “wash the floor and put down some epoxy paint” discovery… any ideas? Hi Crimk. Actually, a high solids coating is the last thing you want to put down. Epoxy coatings and moisture do not play well together. The reason is that moisture vapor that collects under the coating will cause it to delaminate. That is why it is always recommended to do a moisture test first before applying epoxy in any environment where moisture is suspect. If you applied paint instead of epoxy, it will just bubble up everywhere. There are special moisture vapor barrier epoxy primers for such situations, but they require a moisture test first, they are expensive ($200 for 1.5 gals that covers 170 sq. ft.), and they require grinding of the concrete before application. Additionally, even if you didn’t have a moisture issue, epoxy will always require etching at the minimum in order to achieve the proper profile for it to penetrate and achieve a good mechanical bond with the concrete. In terms of reducing your moisture issue, we recommend filling/repairing all your cracks and then apply a densifier. Densifiers are inexpensive and do a good job of reducing moisture intrusion. This review of a densifier explains how they work. After that, you may want to consider an interlocking tile system. These type of systems are easy to install, they allow your concrete to breathe and they allow air flow underneath so you do not develop mold or mildew. I want to mix very fine sea shells (washed and dried) to form a smooth topping on the cement around my bath and the shower floor. Is this at all possible without the water damaging it. Will I be able to use either one of the products? Hello Carol. It’s hard to say without knowing all the details about your floor. Doing something like that would require a water clear bar top type of epoxy and would also require gluing all the shells down first. You would also need a perimeter damn (either the wall, adjoining floor tile, shower pan, or etc. that would contain the epoxy. The epoxy would have to be poured a little thicker than your tallest shell. We are looking to do our basement in epoxy… at least one room for sure. What do you suggest is the best route? I don’t want to spend hundreds on something that’s not going to hold up. Hi Branda. The first thing you want to do is a moisture test. Basements tend to get damp floors and if yours does as well you will have issues with peeling. If your basement floor does not have moisture issues, then we would suggest a single-part polyurea coating. These are excellent for the price and fairly easy to install. They are solvent based so you will have some fumes, but they will dissipate fairly quickly as the coating cures. Remember that you will still need to etch the concrete or grind to install a coating. Hi Karal. If you are looking for the best epoxy product that will provide the best durability you will not get it from a Rust-Oleum garage floor coating kit. What you need is commercial quality, high solids products that can be purchased from vendors that specialize in concrete floor coatings. For metallics it generally requires application of a dark colored epoxy primer coat followed up with the high solids metallic color coat. After that you need to apply a high performance clear coat. One thing to consider is that as nice as metallic epoxy looks, small little scratches stand out much, much more than traditional coatings due to the coloring and high gloss nature of the flooring. Pure Metallics is one example of a concrete coating vendor. 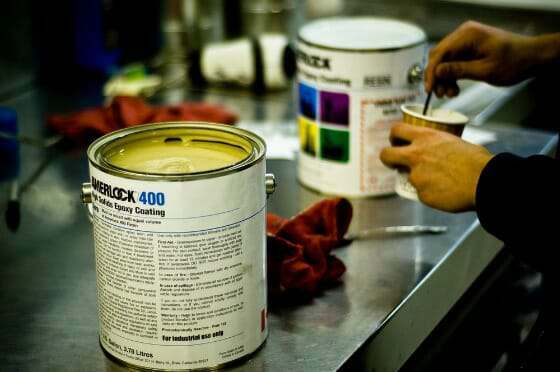 If you decide against a metallic coating, you can still go the traditional route of an epoxy primer, color coat, optional color flakes, and high performance clear coat for an extremely durable coating. If you are only going to be doing light mechanic work, then the new single-part polyurea coatings would perform very well for you also. I got a decent price for RokRez 100% solid and just wondering if i can get more feedback about this product? Also got a price for PPG Pittguard, and wondering what i should use? Hello Dan. If you are applying it to a concrete floor you will want to use the RokRez and not the PPG Pitt-Guard. The Pitt-Guard is for applications to rusty metal surfaces. The RokRez is 100% solids epoxy so it will go down approximately 10 mils thick which is good. We would recommend applying a high performance polyurethane or polyurea clear coat over the epoxy. Epoxy scratches much more easily than the clear and will keep it looking new longer. Yes to concrete. Good to know, because the sales rep told me it is also for concrete. Thanks for the quick response. You’re welcome, Dan. The PPG can be applied to concrete as the rep said, but we have found in our experience that dual purpose applications such as these don’t perform equal to the coatings that are designed specifically for concrete. I used a water based epoxy coating about 20 years ago. All I had to do was power wash the floor clean and roll it out. This was a new unused garage floor at the time. I seem to recall putting on three coats because it was a very thin layer. I’m sure the old container said future coats could be added by just cleaning the floor again and painting over the existing layers. Everything I’ve been reading hear talks of having to etch the concrete in one way or another. Can you clarify on this. Hello SF. From your description of the product and the concrete prep requirements, we seriously doubt it was a true epoxy coating. It sounds more like 1-part epoxy paint which is latex paint fortified with a little bit of epoxy. It doesn’t require a lot of concrete prep and it goes on thin. True epoxy is a 2-part coating that requires mixing of two components. You have a limited time to apply it and it goes on much thicker than paint. This article explains some of the differences. Concrete prep for coatings requires etching at a minimum regardless of whether or not the concrete is new or not. In fact, newer concrete typically requires it even more since the troweling process tends to close up more pores. Epoxy, as well as other coatings, require that these pores be opened up to facilitate the penetration of the thicker coatings. Is there such thing as a zero VOC epoxy paint that we could use on old (15 years) residential floor tile? We would like to use in all rooms including kitchen and bathrooms. If yes, would sheen matter? High gloss verses matte? Hello Kenny. Just to be clear epoxy is not paint. This article will explain the differences. 100% solids epoxy has no VOC’s. However, it cannot be applied over tile. It will not adhere for a variety of reasons, the biggest being that tile is not porous like concrete is. Also, the epoxy will not smooth out and level the surface if that is what you were hoping for. I have a patio that I applied 2 coats of Rust-Oleum to, plus a clear coat to. Over time it has become blotchy. The patio has solar screens, but I live in the Southwest, so the sun is intense. Is there anything I can apply over the top. Or should I just consider putting down something like tile? It is still tolerable. Hello Bob. Epoxy is not U.V. stable. It will amber and can even chalk if exposed to sunlight for too long. That would explain the current blotchy look. What you can do is apply a U.V. stable coating over the top. It would require roughing up the current coating with 120 grit sandpaper first in order to provide a mechanical grip for the new coating. We have an article here about how to do that. An example of a U.V. stable coating would be a tinted polyurethane or single-part polyurea. We did an article on a new coating by Rust Bullet called DuraGrade Concrete. It is a good example of a U.V. stable product that is also low in VOC’s with many color options available. I have an enclosed sun room that I am trying to solve a floor problem with. The concrete has been stained and poly coated but cracks developed and now I am looking for a way to cover and smooth all. Do you think that epoxy would be a way to accomplish this or do you have a better suggestion? Hello Chuck. Are the cracks in the finish or the concrete? Also, what is the exact product that is on the concrete currently? The cracks are in the concrete. I am not sure what is on the concrete it was a sealer that the contractor put on it after it was stained. Thanks Chuck. In order to apply a coating that will create a nice even surface, you will need to properly repair the cracks first and most likely have to remove the existing clear coating. Since this area sees foot traffic only, we are guessing that it was an acrylic clear sealer that was used over the stain. You can test by applying a few ounces of MEK on the surface. Let it sit for a few minutes and then rub it hard with a rag. If the coating softens at all, then it’s acrylic. Proper colored coatings are not compatible with acrylic and is why it would have to be removed. The best method is via grinding, but you can chemically strip it as well. It can be messier to chemically strip than grinding. Epoxy is not a good choice for a sun room. The reason is that epoxy is not U.V. stable and will amber (yellow tint). Rust Bullet has a new product called DuraGrade Concrete that we did an article on here. It would be a great candidate for a sun room. It’s available in multiple colors and is U.V. stable. It’s either that or a polyurea coating, but most of those are only available in traditional gray, tan, and sometimes white. One other option would be the much less expensive solid acrylic stains. This is an example from Behr. These can be applied over acrylics and just require a light sanding first. Just keep in mind that these type of products do not hide irregularities in the surface very well at all. They also have a reputation for peeling up if not applied well. Can two part epoxy or rocksolid kit work with heated floors? Hello Rick. Yes, any type of coating will work fine with heated floors.